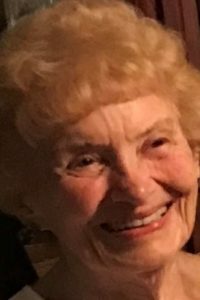 MILDRED “MILLIE” MYERS, 92, of Solon, Ohio and New Port Richey, Florida, died peacefully Friday, March 22, 2019 in Florida. Millie lived fully to the last. She had laid out her running clothes for her morning tradition and had scheduled a golf game with friends later that day. Millie was an avid contract bridge player. She served others as an RN for over 50 years, in hospitals, schools and as a home health nurse. She worked for Solon and Warrensville School Districts, as well as the Cuyahoga County Board of Health. Millie was active in two church congregations, Trinity Presbyterian (Florida) and Solon Community Church. Millie’s greatest love was her family. She is survived by her children: Sharon (David) Klimm, Paul (Lori) Myers, and Carol (Steve) Meara. She cherished each of her grandchildren: Paul, Cara, Katherine, Hannah and Gina and her eleven nieces and nephews and their families. She is preceded in death by her beloved husband Gene to whom she was married 61 years. She is also predeceased by her only sister, Elaine Morrison. Millie was born September 22, 1926 in Sydney, Nova Scotia to Marion (nee Madore) and Charles Fraser. A memorial service will be held at Solon Community Church, 33955 Sherbrook Park Dr., Solon, on April 6, 2019. Visitation begins at noon with a funeral service immediately following at 1:30 pm. In lieu of flowers, memorials to the Mozambique School Lunch Initiative (https://www.mozambiqueschoollunchinitiative.org/donate) would be appreciated.